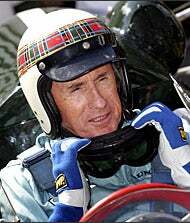 The Formula One season gets started this weekend in Australia, so of course Jackie Stewart (number 8 on the top 100 F1 drivers of all time list) is talking. We were struck by how much...well, flat-out human carnage that the man has witnessed. According to the story from The Sydney Morning Herald, Stewart won 27 times—but also saw 57 "close friends, colleagues and competitors" perish on the track. Yeesh. That's hard-core. Makes us appreciate the much-improved safety record F1 has racked up since the last driver lost it all: Ayrton Senna in '94.